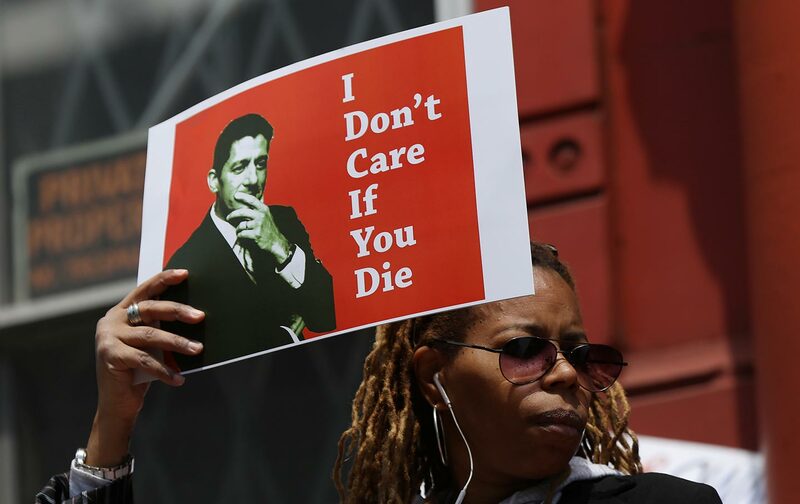 A long-awaited analysis from the Congressional Budget Office confirms that the GOP’s health-care bill punishes people with preexisting conditions. How bad is the Republican rewrite of Obamacare? So bad, apparently, that the GOP candidate for Montana’s lone congressional seat allegedly assaulted a reporter rather than answer a question about it. Trumpcare is such a mess that a GOP candidate allegedly assaulted a reporter rather than answer a question about it. The incident perfectly illustrates the corner that Republicans have backed themselves into with Trumpcare. For months, President Trump, House Speaker Paul Ryan, and other GOP leaders have promised not only to repeal Obamacare but to replace it with something that will lower premiums, increase access, and preserve Obamacare’s popular protections for people with preexisting conditions. Several analyses indicated Trumpcare fell fall short by these measures, but Republicans insisted their critics were wrong. In early May, House Republicans jammed through an amended version before the nonpartisan CBO had a chance to crunch the numbers. Then they celebrated with a party in the Rose Garden. According to the CBO’s analysis, one-sixth of the population could face increasingly unstable insurance markets. With the CBO score out now, it’s harder for Republicans to evade questions about the impact of their plan. (Though body slamming a reporter is an… interesting way to try.) The picture painted by the new analysis is ugly: Much like the original version of the AHCA, which was pulled in March after it failed to get enough support, the bill penalizes elderly, poor, and sick Americans in exchange for lower premiums for the young and healthy, and a large tax cut for the wealthy. Some 23 million fewer people would be insured over the next decade, more than half of those because of an $800 billion gouge to Medicaid. Some low-income elderly people could see their premiums go up by 800 percent. Treatment for substance abuse and maternity care could cost thousands of dollars more in out-of-pocket costs. An estimated one-sixth of the population would face increasingly unstable insurance markets. Ryan tried to put a positive spin on the CBO’s figures, claiming they confirm that the AHCA will lower premiums and reduce the deficit. Technically, that’s true—but premiums will be lower because they’ll cover fewer services, and because older, sicker people will get priced out of the market, lowering costs for everyone who remains. And only about 10 percent of the savings go towards deficit reduction; the rest finances $874 billion in tax cuts. Ryan might still make a case for the AHCA on these dubious merits. He could even argue that pulling the rug out from sick and elderly people is really a worthwhile trade for letting the rich keep more of their tax dollars. But that’s not the health-care plan GOP leaders repeatedly promised to deliver.